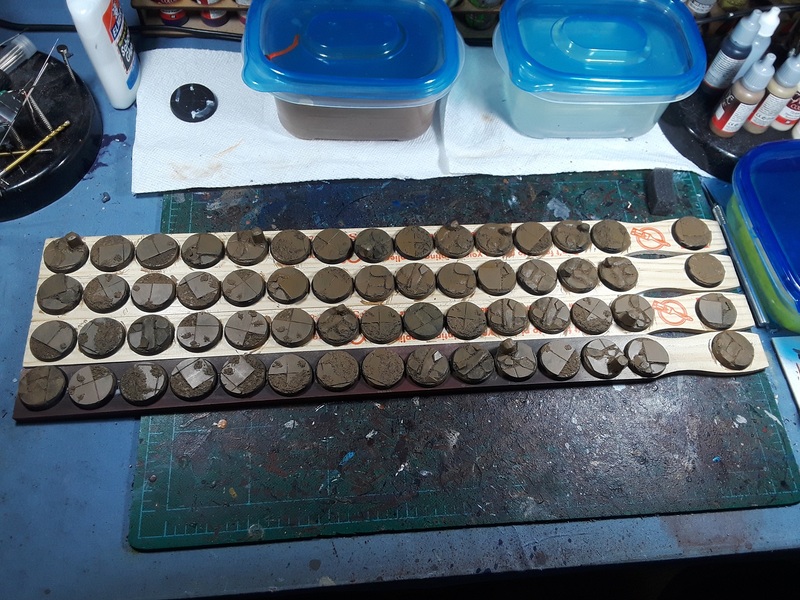 Work continues apace on the World Eaters force for Adepticon, and while I've been diligently beavering away in the background on a mess of models I haven't posted much in the way of pics as I'd been awaiting the delivery of all the bases. They finally arrived earlier this week and I was excited to get stuck in! 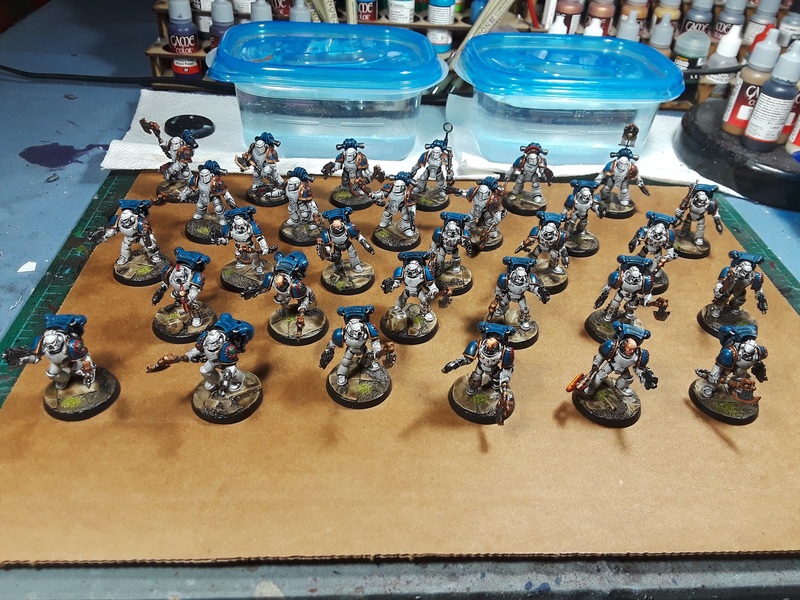 The original plan was to do a combined Word Bearers/World Eaters force all on the white marble Armatura bases, but after a couple test assemblies I really wasn't happy with the white-on-white look with the World Eaters. Sometimes what makes sense in your head in the planning stages just doesn't work out on the tabletop and you have to be flexible. 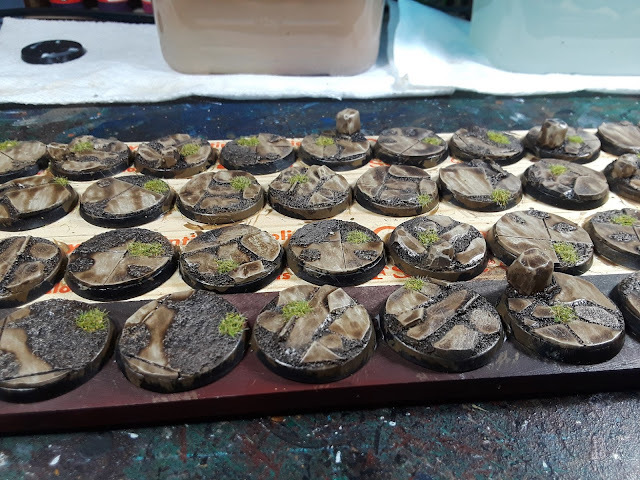 New bases were ordered and I decided I'd go with a darker warm tone with them to set off against the cooler whites and blues of the Eaters of Worlds' armour. Busted out some paint stir sticks and tacked a whole mess of based down and got cracking! Kept the dirt really dark and added in some sandstone to contrast, and then sprinkled on some static grass there and there to jazz them up a bit and add a little spot color to set off against the colors on the infantry. Once that dried I popped 'em all off the sticks and set to pinning and gluing up all the dudes. Once everyone was glued in place I went through and blacked in all the base rims and gave them a penultimate sealant pass. Quite pleased already with how much better the models pop on the bases compared to the earlier white marble, where they all just sort of blended in as a big white blob! Next up is adding some blood spatter and some chipping here and there and they'll be table-ready for Adepticon! 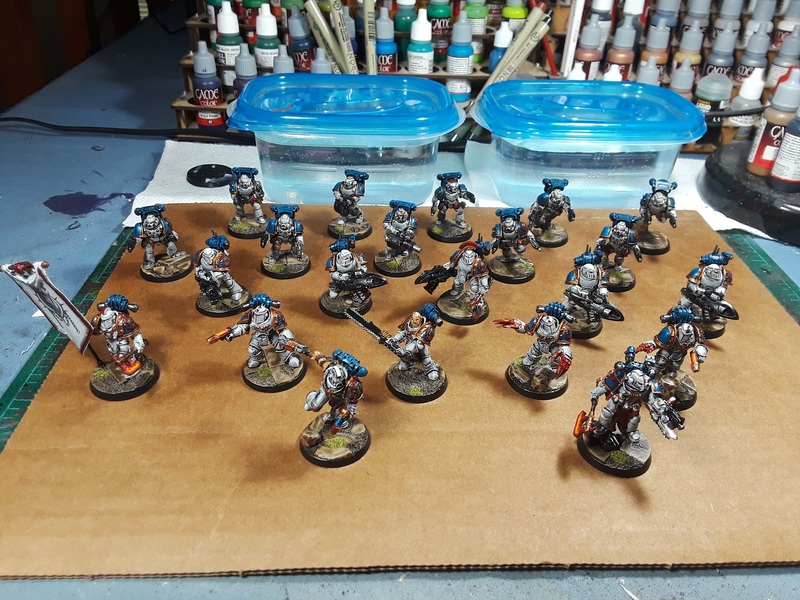 In the home stretch now, just a trio of dreadnoughts and a Rhino to go - With the advent of the recent FAQ, there were some point cost drops in the force I had planned, so I have to come up with a few extra models and wargear here and there to make up the points. So far, so good! Your choice of base with the splashes of green looks great with these! Awesome biscuity Base! Cheers! Pretty jazzed by the contrast! They came out really well, bravo. Not easy to get so much done at that speed. Pinning takes me ages. Aye, not sure that the extra effort painting them separate then combining was worth it, but gotta experiment from time to time! Yeah, I think you made a good call there. They contrast really nicely against these. Armies & Legions & Hordes arrives on the scene!